This tour is very active, requiring participants to be physically fit to fully enjoy all the experiences. This itinerary has more strenuous activities which may include such things as: extensive walking tours, transfers over uneven and dusty terrain, high altitudes, early morning departures, late night activities, or extreme temperatures. All conditions do not apply to all days, so please read the itinerary carefully and speak to one of our travel counsellors to determine if this tour is right for you. We recommend this program to individuals who are physically fit. Unfortunately, this tour is not appropriate for individuals who use either walkers or wheelchairs. If this trip is not ideally suited for you, our travel counsellors can help determine the perfect trip for you. A family emergency caused us to have a "stand-in" tour guide, but it was our lucky day. Peter Camara was the BEST, hands down! Some hotels lacked amenities and much needed drawer space. Well organized. Excellent local Guides. Awesome tour manager. Great hotels. Variety of venues and events. Wildlife. Milford Sound was exceptional. We received a good value for our money and had a great travel quide. Had problems with our group airline flights from New Zealand and Fiji. Thank you for traveling with Collette to the South Pacific. We do not have any notes on file regarding your group having flight issues from Queenstown to Fiji. If you can provide us with more information, our air department can review it to improve the overall touring experience for our guests. Yes, had beautiful tours/lovely accomodations/great food! I thought the whole experience was excellent. Only drawback for me was the long plane ride, but that was to be expected, coming from Michigan and going way to Australia/New Zealand! My group enjoyed all the tours, food and every aspect of the trip . We loved the sheep sheering and the Great Barrier Reethe cruises and the gondola ride meet and greet meeting with the Aboridgenies. It was a wonderful tour and everything went better than expected. Difficult to determine the favorite. It's hard to pick one...All had their great experience s.
Overall the trip was sensational! However, I thought the flights could have been fewer - more direct flight to & from Kansas City. Our tour guide was the best! The hotels were fine except for us in a triple room - rooms too small!! Wonderful memories! Loved all the cities! Enjoyed dinner with host family, all the wildlife experiences, the Jetski ride, but my favorite was queenstown! Customer service needs overhauled. I paid the extra amount for first class. When documents were sent I only had first class from California to New Zealand. Same for my return. $10,400 for two flights. I cancelled and scheduled my own air for $5,000 from Kansas Cory to Sydney. Collette never reimbursed me for the air I did not use. Saved $5,400 and got more air travel than Colette was giving me for $10,400. Need I say this was not good advertisement for your company. Fiji was great. Should have had more days there. Thank you for traveling with Collette to the South Pacific. We're sorry to hear our Air Reservations Team could not find an acceptable international schedule for your tour. The refund for your unused air ($10,105.00) was credited back to your Visa card on September 28th, 2018. The trip was ok, but nothing extraordinary. Collette did a terrible job on flight arrangements. After asking for seat preferences, almost every seat they had assigned was a middle seat, not the aisle seat requested. I made some changes with the airlines directly, but it cost me an extra $338. It took over 2.5 hours to get boarding passes in BOS, because Collette screwed up the bookings. (not just us but everyone traveling with Seacoast Science) Similarly, we had an issue from Fiji to the US. The Fiji Airlines rep at the hotel stated 'Oh, Collettet, they are the worst. The food service at the resort in Fiji was terrible - they simply didn't care.That being said, out tour director in Aus and NZ was excellent. Travel was very poor. Collette screwed up with the airlines. Didn't have flight information until a day or two before the trip started. Seat assignments were not even close to what was requested. Cost an extra $338 to fix. Waited about 2.5 hours in BOS to get boarding passed - Collette errors with the airline. Likewise problems leaving Fiji. Resort staff (in particular restaurant) in Fiji resort was terrible. This should have been a great trip - oh-well, never again with Collette. Thank you for traveling with Collette to the South Pacific. A member of the Guest Relations Team will be reaching out to discuss your feedback. Minimize plane changeovers and layovers. Travel itinerary was poorly planned. Plane changeovers and excessive layovers could have been minimized. Verify flight arrangements with airline. 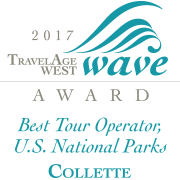 Have Collette representative available at all departures to resolve booking issues. Flight arrangements were not verified by Collette prior to departure. United Airlines could not find our booking, taking well over an hour to resolve at check in. A similar issue occurred with Fiji Airline on the return trip. No Collette representative was present to resolve. Update Fiji extension description. There was no “expansive sandy beach with clear ocean water” anywhere close to our hotel. Instead, the beach was muddy silt and water murky. Fiji hotel restaurant staff was inattentive and unwilling to help. We had to go out of our way, and ask several times, for water and coffee to be served. Meal orders were lost or forgotten. What we expected was a small group tour with emphasis on the natural history aspects of the areas visited. Instead, it was a large group with itinerary no different than tours offered at significantly lower cost. Thank you for traveling with Collette to the South Pacific. Your feedback will be reviewed by our internal department managers so that the overall touring experience can be improved upon. when ever there was sudden change in the schedule or cancelation of a tour etc or guide was able to rearrange schedules or what ever needed to be done to keep everyone on track. Good tour manager and guides with local knowledge and hotels in central locations.Well organized and interesting excursions.Plenty of room on coaches good polite drivers and even when coach broke down due to flat tire problem was quickly resolved without much delay to onward journey. Lots of different places and countries visited and all of them good.The jet boat ride on the shotover river in queenstown New Zealand was a great experience. I really liked our tour director she was wonderful and extremely helpful. I think that the tour itself should be rearranged. Too much time was spent in New Zealand with so much less to do. Australia was wonderful. I wish we could have spent more time there. Possibly going to Melbourne and Bisbane. There was so much more to see and we just weren’t there long enough to do everything I would have liked to. New Zealand was pretty but just not much to do. The allocation of dates in New Zealand needs to be reduced. Loved climbing the Sydney Harbour Bridge. It was an additional cost but it was my favorite part of the vacation. Thank you for traveling with Collette to the South Pacific. Your feedback will be reviewed by the Product Development Team so that the necessary itinerary changes can be made. Fun, informative, relaxing, beautiful scenery. The tour was well organized, we had a wonderful tour leader. She really did some extra things to make us feel special, like at Hartly's crock farm arranging for a private time with a koala for our group. The pace of trip was great and the food was terrific. Amazing countryside, mountains and people. Really enjoyed dinner at a home of a local couple. We missed a connecting flight and Collette was very helpful with rescheduling. Really enjoyed the tour. We saw a lot of interesting things. The trip was good. Some unexpected glitches, mostly air travel related.Tour guide excellent, lots of early departures and long bus rides not the best. Being on the bus for long rides should be explored. The trip and the tours were very good. The tour leader was excellent. The air travel was long and uncomfortable. Long bus rides during the trip to different locations must be discussed, too much down time. Three of the four hotels were excellent, one in Christchurch just average, should be looked into. Well planned trip, excellent tour manager, no glitches except trip to Milford Sound was cancelled due to snow and closed road. Tour manager did everything to make this up by taking us to the Glow Worm cave. All good. Home visit in Christchurch. The whole trip was will done. Our tour guide, Stacey was wonderful! She was knowledgeable and friendly,and took care of any potential issues so quickly that we weren't even affected. My one complaint would be the booking of plane tickets. It was already long flights, then adding on long layovers at each place made it worse. Also, our tour packet from Collette was inaccurate in regards to included meals. So, it looked like we weren't supposed to get meals that we really were. This was a wonderful trip! Perfect if you just want a taste of the two countries. The Sydney Opera House and Milford Sound were the highlights, for me. It was much more relaxed than other tours I've been on, with lots of time to explore on your own. We went during their winter season, so it was cooler, but not as crowded. Everything was planned down to the most minute detail. The tour guide(s) were outstanding. They knew so much and we learned so many things we wouldn't have had we taken this trip on our own. We toured Australia, New Zealand, and Fiji on the Southeast Pacific Tour. My favorite stop was the Lord of the Rings Tour in New Zealand. Stunningly beautiful scenery that was breathtakingly spectacular! Everything about the trip was perfect! The amount of time in each city was excellent. Collette’s helpfulness through the numerous airports was much appreciated. The 2 drivers on the days on motor coaches (Sydney & to Milford Sound) were courteous & well informed. Our Tour Manager (Caryn) went above & beyond to make sure all details were handled & we knew what to expect in each city. She had maps available & offered varied suggestions on places to eat, shop, and see. The travel information received before the trip was very helpful. The size of the group was perfect (22) - weather couldn’t have been any better - our Tour Manager (Caryn) was so nice and helpful. New Zealand was the best - air flight back from Milford Sound was awesome. Off- road trip around Queenstown offered amazing sights. We even chose to tandem paraglide off Coronet Peak - words can’t describe that fabulous experience!! Initial customer service was poor. Incorrect information, mistakes, hard to reach. Insufficient hours of operation were inconvenient especially outside of the eastern time zone. Having dinner with a local family was a nice touch. Thank you for your feedback. Your comments have been forwarded to the Client Care Center. They will use your feedback to improve the pre-tour booking process. Everything was top notch. No worries over transfers and luggage. Accommodates we all great. Outr tour manager Kim was informative, entertaining and helpful. The weather was a bit in cooperative but we trucked on anyway. Yes, everything was taken care of. The hotel were great and tours were varied and fun. Thank you for taking the time to provide us with feedback on your tour to the South Pacific. A member of the Guest Relations Team will be reaching out to you to discuss your comments. Travel guide was excellent. 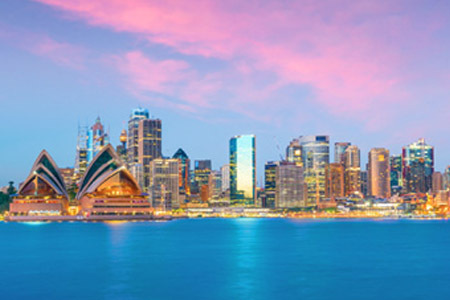 You could improve in having a person at Sydney airport to guide your travelers for flight connection to Cairns. The flight to Cairns was at the other airport and you needed a shuttle. It was very confusing, especially after a 15.5 hr flight and going thru customs. If you are going to Sydney for New Years Eve, spend to money to have a hotel close, so elderly people can see fireworks. Other than that, it was a wonderful trip! Snorkling over the Great Barrier Reef, New Years Eve fireworks, visiting a farm in New Zealand, dinner with a local, Steamboat ride and all meals were excellent, except lunch on excursion to barrier reef & 4 wheeling in river. Queenstown is breath taking! Too many people on tour(lot's of time wasted getting on and off buses and airplanes) and will choose a tour company next with fewer participants. We are not experienced travelers, so I don't have a lot of experiences to compare to. Our trip was well organized and all the prearranging, (airlines, visas, bus connections), were done without a hitch. Collette provides a limo service, witch is nice, ours was a 1/2 hour late, witch started off our trip a little nervous, but we made the plane on time, just in time, (don't think it was our drivers fault, not sure they gave him enough time to get to our house). Our tour guide was great, very personable, and competent. Cairns I liked Cairns,Hartleys Croc Farm was good, Green Island was bad, very over crowded, diving was terrible, you can only dive where they tell you and that's crowded, and nothing to see. They should include the "Outer Barrier reef" (a $155.00 PP option) as standard, in my opinion. Sydney Beautiful city- Our Hotel was close to Darling Harbor. Enjoyed all of Sydney. New Zealand All of it is great - But really got blow away by Queenstown, it snowed twice while we were there, which made the mountains and the lake around there unbelievable. My favorite place!! The tour was well organized, included what we wanted to see as well as experiences we couldn't have planned on our own. The tour manager, ***, was very personable and made every effort to accommodate personal preferences. The tour guides were knowledgeable and entertaining. There were too many people on the tour (41). The tour started later in the morning each day at 10:00. Most tours start earlier in the day. On free days we arranged for activities on our own with little help from the tour manager. Our most memorable days were those that we did on our own. For example, we booked a trip to a village up the coast from Queenstown and enjoyed a boat trip to see penguins, sea lions, dolphins, and amazing geology. That trip should have been included in the itinerary. This trip had too much free time, not enough learning presented by the guides, and too many people on the tour. Optional tours were the best times so if someone did not buy optional tours, they would not have had many memorable events. Wow and double Wow - New Zealand is so beautiful and trip was amazing! This was our 5th trip with Collette and as in the past, it was excellent. The tour Manager was excellent. His name is Jim and he really helped everyone enjoy the adventure of the trip to Australia and New Zealand. I enjoyed all of the activities that we did on the tour. Our tour director was great! My. Ingest complaint would have to do with the airfare. I found it very annoying to not have seat assignments ahead of the trip and what made it worse was the emails fro Collette telling me to check in online, but not being able to do so. I really enjoyed our trip to Milford Sound. The weather was perfect, the scenery was fabulous and we were able to fly back to Queenstown to take in the beautiful scenery from above! The Jetboat ride was great fun! Visiting with a local family in Christchurch add for a very pleasant evening. Our guide, Jim, was helpful, well organized and knowledgeable, making the trip a great experience. The Maori cultural center was excellent. Collette came through again for me. On this my 8th tour, I had the best time ever. The tour manager, Jim was the best. He helped us with everything we were going to encounter. From the extra excursions to what was included it was an awesome time. If anyone wants to go "down under" Collette is the tour company to use. 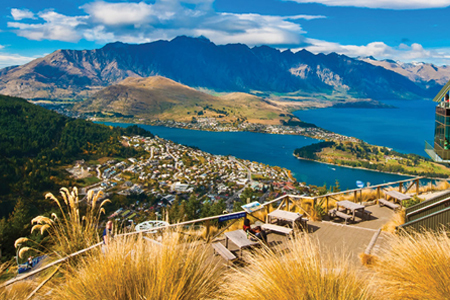 The fiord cruise, jet boat ride and gondola ride in Queenstown were highlights. Actually the whole tour was a 5 star. AWESOME TRIP! A must for your bucket list. The hotel location and services were key for me and they were excellent. Also, we were on 3 airline flights as a group and it couldn't have been easier or more organized. Loved the trip and already have recommended it to others. The great barrier reef was my favorite. It was a wonderful experience! The trip was great. Everything was well planned. All I had to do was to relax and enjoy the trip. There were so many memorable experiences. The great barrier reef, the Sydney Opera House and both of New Zealand's north and south islands were spectacular. great tour and especially a great tour guide. Optional choices were excellent. The best part to us was the south island of New Zealand. The native cultural experiences in Australia and New Zealand. We had a phenomenal tour manager. Collette listens and is very helpful. We saw some amazing things and had some wonderful experiences. Our day long trip to the Great Barrier Reef was a highlight. We were able to enjoy a home cooked meal with a host family in Christchurch. Excellent tour guide, good itinerary, nice travel buss and drivers. 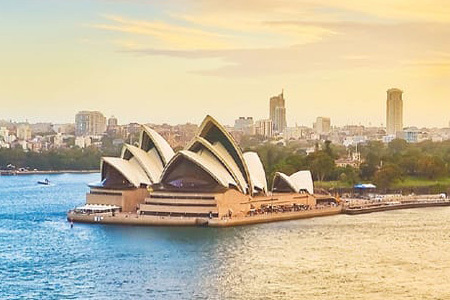 Enjoy the South Pacific, from the splendour of Australia's Great Barrier Reef to the beauty of New Zealand's glacial fjords, before venturing on to the beautiful tropical paradise of Fiji. Dream Big. Explore the Outback in Australia and discover Mt. Cook in New Zealand on this grand tour of the South Pacific. 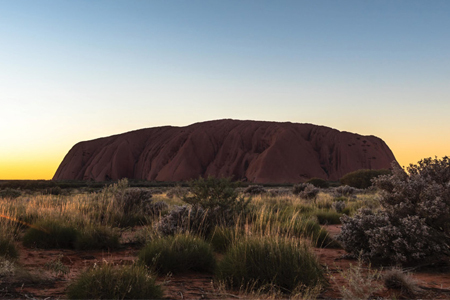 Experience the natural splendour of New Zealand's Southern Alps as well as the Aboriginal culture in Australia's Outback on a journey that showcases the diversity of the lands Down Under. 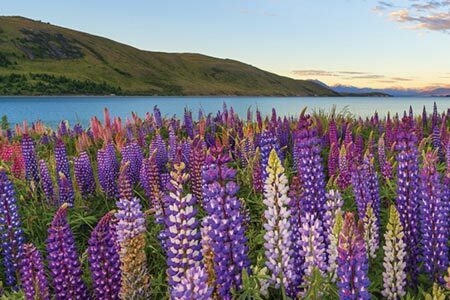 Explore New Zealand's many sides, including the geothermal landscape of Rotorua and the temperate glacial landscape of the Franz Josef Glacier. 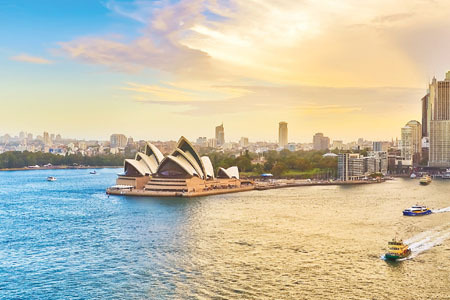 From the tropical splendour of the Australia's Great Barrier Reef to the ethereal beauty of New Zealand's glacial fjords, enjoy the best of two amazing countries. Explore Australia's diverse landscapes and cultures as we bring out the best of this incredible continent. Due to early arrival times in some cities, rooms may not always be ready for immediate check-in. Due to changes in air schedules while on tour, the order of days in the itinerary may change. Previous guests have indicated that a small gift from your area is appropriate and appreciated the night of your home hosted dinner in New Zealand. Visa Requirements: US and Canadian citizens: An ETA (Electronic Travel Authority) is required for your travel to Australia. Travel Agents that have access to a CRS system can process your ETA at no charge or they may call the guest's airline no earlier than 30 days prior to departure (credit card is required). If you do not have access to a CRS system, you will be supplied with an ETA form and asked to fax this information back to us 45 days prior to departure. Please send the fax in care of the Australian ETA Coordinator at fax 401-727-4745. Please include the (required) Reservation Number, Passport Number, Nationality, Date of Birth, Gender, Country of Birth, Passport Expiration Date, Family or Last Name (as shown on passport), First and/or Middle Name Given (as shown on your passport) and Issuing Authority.